Warning: This recap includes spoilers for Episode 10 of "Star Trek: Discovery" and a discussion of sensitive and potentially triggering topics. Tyler's past torture by Klingons is making him act erratically as the USS Discovery tries to escape from an alternate universe in this newest episode, "Despite Yourself," which is one of the series' darkest yet. So, yeah, that was a shocker. But is Cruz actually permanently dead? Trekkies know that "The Original Series" character Spock (Leonard Nimoy) once died heroically and came back, after all. Fan lists remind us of other "Star Trek" main characters who died and returned due to manipulations of time or universes (remember that the Discovery crew is trapped in an alternate universe, so that could apply), futuristic medicine or some other scriptwriting magic. And one of the showrunners, Aaron Harberts, recently told TV Guide that the audience will see more of Culber. We just don't know if it will be through a resurrection, flashbacks or some other means — yet. And it makes me wonder who is controlling his personality — Tyler himself? The captured Klingon L'Rell (Mary Chieffo), who is responsible for Tyler's trauma on the Klingon ship? Some sort of "The Bourne Identity"-like supersoldier automatic programming? Some fans are going so far as to say Tyler is an actual Klingon, which could also explain his behavior. We'll have to watch more episodes to get the story. On a related note, I loved the line Capt. Gabriel Lorca (Jason Isaacs) delivers when a confused-looking Tyler reports to him a few seconds later, while the audience is still woozy from witnessing the attack. Lorca, who is unaware of what happened, advises Tyler that "decency is weakness and will get us killed" in the alternate universe. 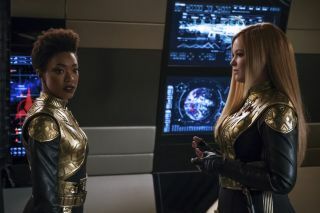 Near the end of the episode, series star Michael Burnham (Sonequa Martin-Green), Lorca and Tyler arrive on the mirror universe's USS Shenzhou — where Burnham is the missing, presumed-dead captain — to gain more information about how to escape, taking advantage of the fact that their mirror-universe equivalents are either missing or unknown. And Tyler — we don't really know where he stands, except that he still very much appears to be in love with Burnham. And, of course, his bad programming could kick in again, so we remain on edge. The next episode of "Star Trek: Discovery" arrives Sunday (Jan. 14). It will become available on CBS All Access in the United States at around 8:30 p.m. Eastern Time. I haven't been this shocked by a TV character's apparent death in almost four years, since a particular character was pushed in front of a subway train during the second season of "House of Cards" (2013-present). Excerpt from my "Discovery" notes, written in real time as I watched: "He broke his NECK OMG OMG." Lorca was advised to mask his voice while communicating with the Terrans on an audio-only channel, because the crew didn't yet know how Lorca fit into the alternate universe. While playing the role of chief engineer, he adopts a Scottish accent — a clear reference to Montgomery Scott from "Star Trek: The Original Series" (1966-1969). Hilarious. The "Discovery" scriptwriters are getting stronger every episode. Among my favorite quotes was this inspirational speech by Burnham, who was trying to bring up Tilly's spirits: "Terran strength is born out of pure necessity, because they live in constant fear, always looking for the next knife aimed at their back. Their strength is painted rust. It's a facade. But you have the strength of an entire crew that believes in you. Fortify yourself with our faith in you. That's what a real captain does." Speaking of Terrans, did anyone else snicker because the word "Terran" got them thinking of the Marvel space adventure "Guardians of the Galaxy" (2014)? I was thinking especially of when Yondu (the blue-faced alien who controls a mini-spear with his whistle) tells Peter Quill that his crew was excited about eating Terrans: "When I picked you up as a kid, these boys wanted to eat you. They ain't never tasted Terran before. I saved your life!" If you're wondering what an Andorian is — I didn't spot any in this episode — they're a blue-skinned species with antennas who are known for their militaristic ways, according to the fan reference site Memory Alpha. They've appeared in most "Star Trek" series, but most frequently in "Star Trek: Enterprise" (2001-05). "Kahless" (the deity who L'Rell and Tyler reference during a Klingon prayer) is known in "Star Trek" lore as a mythical Klingon warrior-king. A handful of franchise episodes have mentioned him.